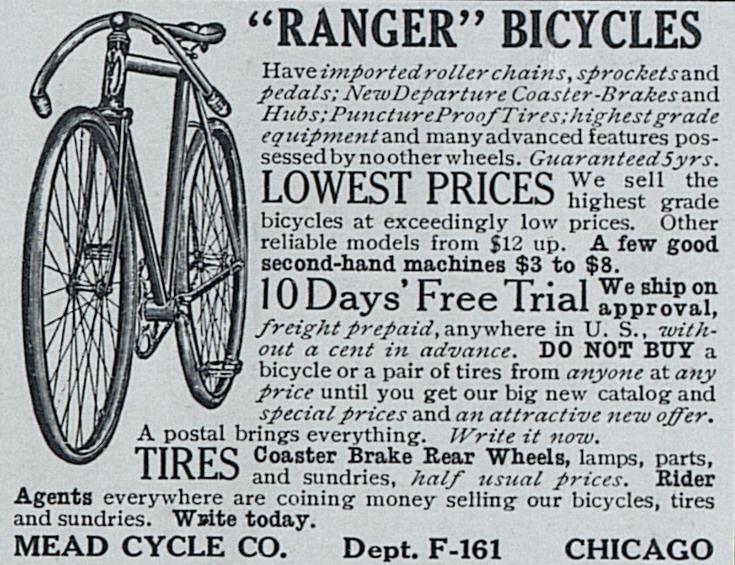 Sigh . . another day with no diary entry.. . but while we’re waiting for Grandma to pick up her pen, I thought that you might enjoy this hundred-year-old bicycle ad. Posted on October 7, 2014 October 2, 2014 by SherylPosted in AdvertisementsTagged 1914. Grandma is really making you work, isn’t she??? It’s interesting that bikes don’t appear to have changed so much over 100 years! They’ve gotten fancier but the basic design has stood the test of time. Apparently the bikes with the huge front wheel and tiny back wheel were from the 1800s–and they’d landed of the more modern bike design by the early 1900s. Love those olds ads with all the italics! The italics, bolding and capitalization are so dramatic. The ad copy writer must have had fun writing this ad. Looks a very sporty model. Those dropped handlebars really give it a snazzy look. 10 days free trial? That’s taking a chance, untried riders might crash the bike.